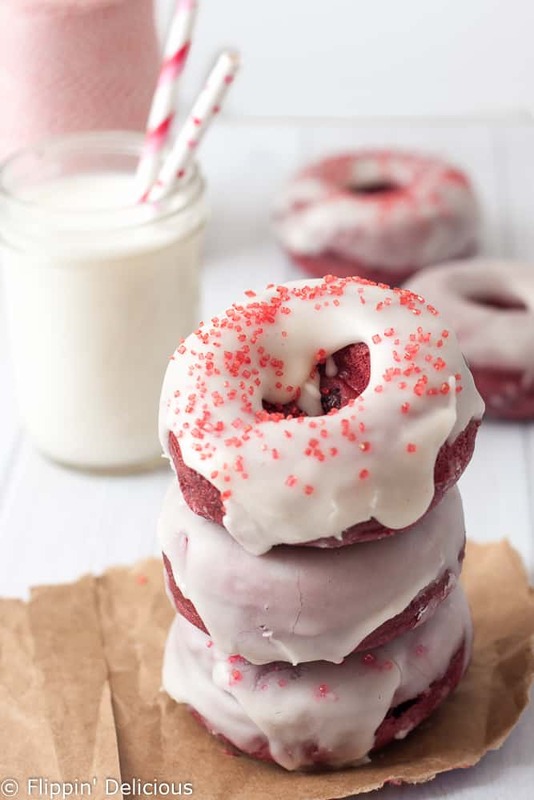 Dairy Free Gluten Free Red Velvet Donut Recipe- quick and easy to make, allergy friendly, and has all the classic red velvet flavors (including a dairy free cream cheese flavored glaze.) 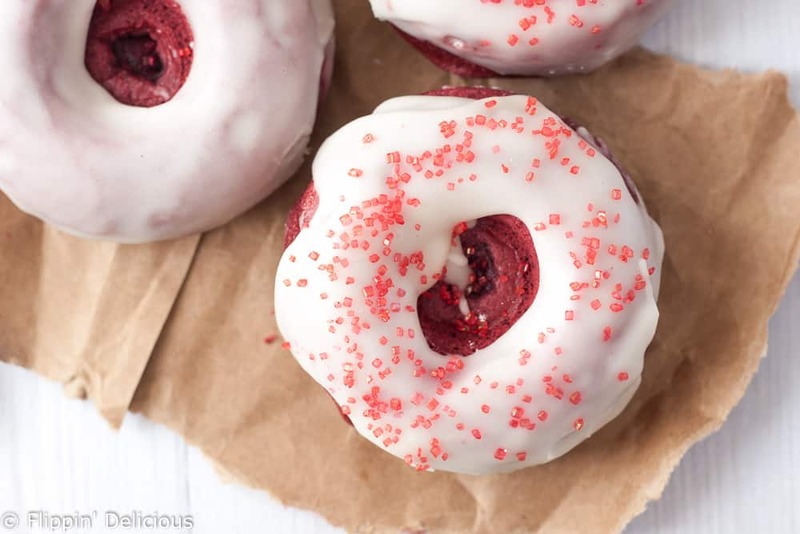 No frying needed, these red velvet donuts are baked! I am a HUGE fan of red velvet! I never had it until I was a teenager, but then I fell in love. 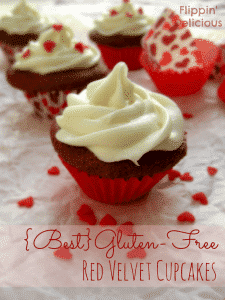 Every year before Valentine’s Day I add a few more gluten free red velvet recipes to my repitiore. Over the years, I have added many gluten free red velvet recipes to my website, including my gluten free red velvet cupcakes which are always a huge hit! I’ve also added gluten free red velvet brownies and gluten free red velvet crinkle cookies, which are easy to bring along to class parties or Valentine’s parties. 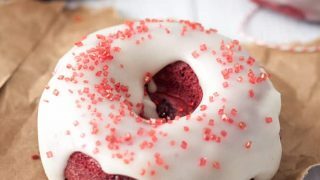 I just knew that I needed to add a dairy free gluten free red velvet donut recipe to Flippin’ Delicious! 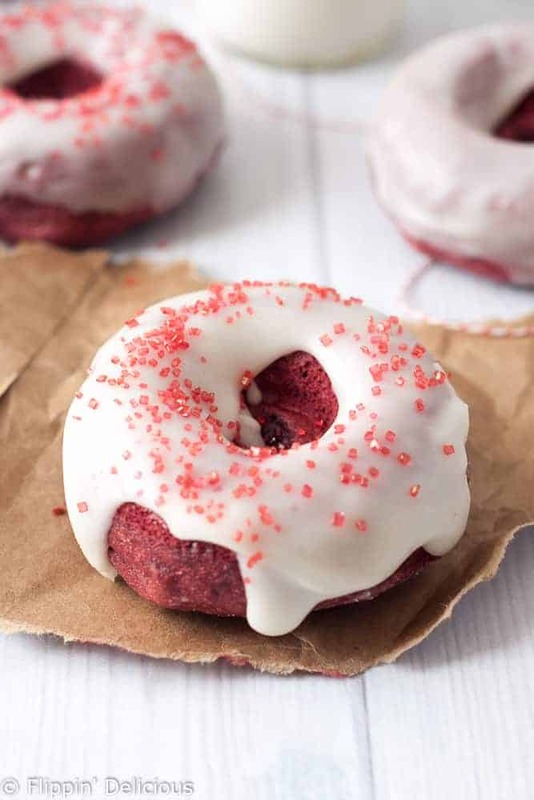 This gluten free baked red velvet donut recipe makes a moist and sweet baked red velvet donut, with a sweet and tangy cream cheese flavored glaze. They really are everything you love about frosted gluten free red velvet cake rolled into a cute little donut. If you don’t have a donut pan, buy one. Why should you buy a donut pan? It is a purchase that I have not regretted one bit! I love making baked gluten free donuts for breakfast on special occasions. Baking donuts is much easier, and less messy, than frying donuts yourself. The pan was pretty inexpensive, and is so worth it. If you don’t have a pan, and just can’t wait to make these gluten free baked red velvet donuts, just bake them in a greased muffin tin. You won’t have the iconic donut shape, but if you bake them in a mini muffin tin they are basically donut holes. Once you buy a donut pan, you can also make these amazing Gluten-Free Cinnamon Sugar Donuts that my dear friend Chrystal from Gluten-Free Palate created. They are amazing! She made them for me for breakfast when I visited her last year. For those of you who don’t know, red velvet is a light chocolate cake flavored with vanilla and a slight tang from vinegar used to leaven the cake. 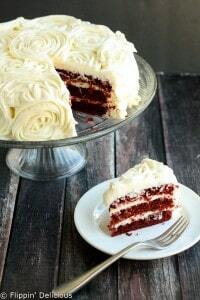 For me, red velvet is not complete without some cream cheese frosting. That is tricky when you are making a dairy free recipe, but I found an easy solution. If you don’t have cheesecake flavor, or the desire to buy it, just omit it. Your frosting won’t have the cream cheese tang, but will still be delicious. You can also frost your gluten free baked red velvet donuts with my easy cream cheese frosting, if you can do dairy. 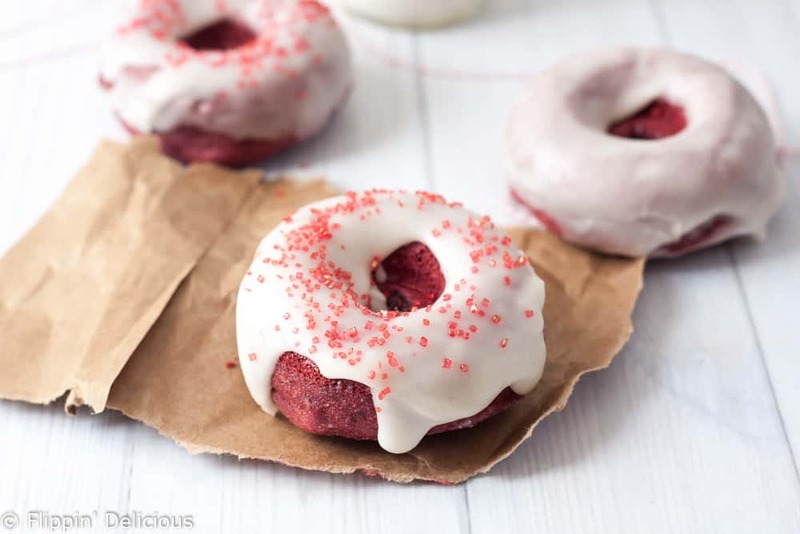 Why did I make my red velvet donuts dairy free? Every recipe on Flippin’ Delicious is gluten free, it has always been that way. Now I am trying to add more dairy free recipes to my blog. Partially because I know that many of you need recipes that are gluten free and dairy free, but also because my family’s need have changed, at least for now. Over the summer my mom had to cut dairy out of her diet. She has been gluten free for a long time, but had started having issues again and dairy seemed to be the culprit. Since then dairy free has been on my radar more and more. I am always looking out for things that she can eat! We thought that is was just the change in seasons. We have been rubbing her down with coconut oil, and saw a little improvement, but her skin hasn’t ever healed all the way. I have been trying to wean her (which is a constant battle, anyone with a high needs baby will tell you the same thing) so I gave her a sippy cup of milk a few days to see if that would help with the weaning thing. (Big surprise, it didn’t.) BUT the day after the sippy cup of milk her skin flared up and her tummy and back were bright red. So we are trying to cut dairy out of our 1 year old’s diet, and I quickly discovered that the only way to keep her from getting any dairy is to have no dairy in the house. Luckily, because of my experience blogging in the gluten free and allergy community, this transition has been easier. I know exactly what to do, so I haven’t been overwhelmed. I’ll stop typing now, and sharing all of my allergy adventures with you. 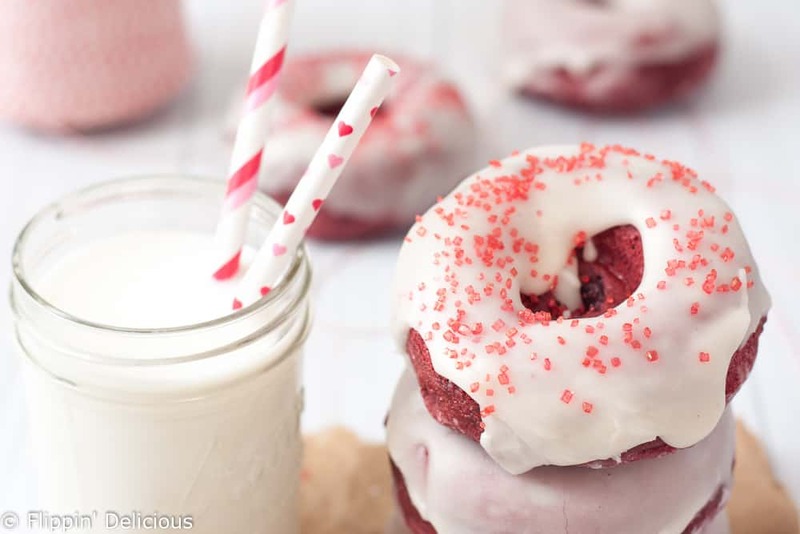 Here is the recipe for dairy free gluten free baked red velvet donuts. Preheat the oven to 425F. Lightly grease your donut pan and set aside. In a measuring cup or small bowl mix together the dairy free milk and vinegar and set aside for 5-10 minutes. In a mixing bowl, whisk together the gluten free flour, sugar, cocoa powder, baking powder, salt, and xanthan gum(if using). Make a "well" in the dry ingredients. Add the milk/vinegar mixture, egg, oil, and food coloring to the well and mix until just combined. Pour the batter into a sandwich bag, seal it, and then cut one of the corners off. Use this makeshift piping bag to fill the donut pan. Bake for 8-10 minutes, or until the donut springs back when you lightly touch it. Dip in the glaze or frost with your favorite frosting. In a small microwave safe bowl, mix together all of the glaze ingredients. Heat in your microwave for 20-30 seconds. You don't want the frosting to boil or bubble, you just want it to be warm and thinner. Quickly dip each donut in the glaze and set aside for the glaze to set. Work quickly, as the glaze will set fast and the glaze does not reheat very well. Don’t miss the rest of my gluten free red velvet recipes! 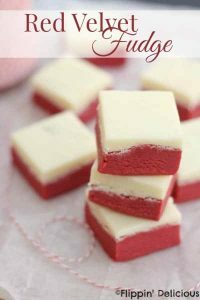 Red velvet fudge, with a cream cheese frosting fudge layer. Naturally gluten-free! Who could pass up red velvet!? What a great doughnut recipe for V-Day! Thanks Rebecca! I think I’ll make them for breakfast on Valentine’s Day for my girls. I am so trying these with the kiddos…fingers crossed the beet red food dye works…it does raw, but I haven’t cooked with it yet!! I can’t wait to hear how the beet red dye works! First. The photography on this post is AMAZING. Second, what food coloring do you use? I have wilton and find that I have to use SOOO much to get any red coloring to come through on red velvet recipes. I used a liquid food coloring. You can buy 2oz bottles of just red food coloring at the grocery store. Can’t remember if it was McCormick or Kroger brand. I also will use Americolor gel sometimes. I bought some when I was making red velvet cupcakes for my sister’s wedding. It just takes a lot of food coloring to get a really bright red. I won’t use as much, and go for a more subtle red, when it isn’t for a photo. Love that these are dairy free, too! They look like the perfect Valentine’s Day indulgence! Thank you Celeste! They really are. I know my family is going to request them for Valentine’s day. Oh My Heavens! These are some of the prettiest donuts I have ever laid eyes on!! Your photos have some serious magic happening in them! Just beautiful pictures!! Thank you for sharing your recipe! Thank you Andrea! I had a lot of fun shooting this recipe. Thank you Sarah! My girls absolutely loved them. This looks like a delicious recipe but it should be noted that on the LorAnn website it states that the Cream Cheese flavor is NOT dairy free. This really matters to those of us who are dealing with true dairy allergies. Thank you Liz! The cheesecake super-strength oil that I used is “free of dairy allergens” Their cream cheese flavoring is not. I will update my post to make it more specific. I don’t want anyone to get confused and get sick! Can’t wait to try these out for my son’s Valentine’s Day party with our homeschool group. I’ve been there with trying to wean a little one and dealing with food issues. My 2 year old can’t have dairy and she refused to take a bottle or cup so weaning was hard because I couldn’t even get her to drink my milk out of a cup to get used to something other than Momma. For a substitute for my milk I gave her a little Kombucha out of a sippy cup. It was the only thing I could get her to drink out of a cup. It helped keep her preoccupied during her normal nursing times and saved my sanity. We also discovered she liked drinking with a straw so as long as we had water bottles with straws we could keep her hydrated. Thanks for the weaning ideas Paula! I at least an get her to drink from a sippy cup. She will drink water no problem. She just still wants to nurse! We’ll have to try a straw! I was wondering what type of Vinegar to use? I’d love to make these today! I would use apple cider vinegar or regular distilled white vinegar. Really any vinegar(except for malt vinegar for GF reasons) will work. You are basically making your own dairy-free “buttermilk” with the vinegar. It is all about the chemical reaction, and not the flavor. That being said, using a flavored vinegar will change the flavor so an aged balsamic or something similar would change the flavor of the donuts. I’m doing Dairy free not so much Gluten free, but they usually go hand in hand. A question. I see and Egg in here isn’t eggs dairy too? I have a Cream Cheese flavoring from Michael’s and not Cheesecake Flavoring , does it matter which one I use? I thought Red Velvet has Cream Cheese Frosting on it not Cheesecake. Hi Eleanor. Eggs are not dairy since they come from chickens instead of cows. Are you maybe thinking vegan instead of dairy free? Eggs are not vegan. If you are looking for egg free too then you can substitute 1 tablespoon ground flax seed with 3 tablespoons hot water. Let it sit for 5 minutes and then use the mixture instead of an egg. I used cheesecake lorann flavored oil because lorann’s cream cheese flavoring has dairy in it. You can use whatever flavoring you would like. I used the cheesecake flavoring to get a similar flavor, while keeping it dairy free. Hi Tru, you can omit the cheesecake flavoring, or substitute vanilla extract. The cheesecake flavoring is just a way to get the cream cheese flavor, without dairy. You outdid yourself again! Love these! I made them in a mini pan, baked for 4 mins and they’re perfect. Do you think it’s possible to make his in a bundt cake pan? Hi Bri, This recipe isn’t made for a large cake. If you want a bundt cake, I would use my gluten-free red velvet cake recipe and adjust the baking time for your bundt pan. You’ll need to cook it longer than the directions say, since a bundt pan holds more than a single layer. Happy Baking! Hi! I made these this morning so good!! My frosting was super runny and not thick and gorgeous white like yours. I didn’t add the cheesecake flavoring because I didn’t have it on hand. Any thoughts on what went wrong? I was thinking that maybe a royal icing could possibly work too? Thanks! Hi Audra, Thank you for taking the time to leave a comment. I’m happy that you loved my donuts! If your icing was runny, it most likely had too much liquid in it. Just a little moisture goes a long way! You want to add just enough so that it is very thick and almost pasty. When you heat it, it will thin out. It is easy to accidentally add a little to much milk, or it could be that you live someplace more humid than I do. How much liquid did you add? How did you measure your powdered sugar? These are the most likely culprits. Comment back and I’ll do my best to help you figure out what happened. Happy Baking! Thanks for responding! I followed your icing recipe for all the liquid ingredients. I poured the powered sugar into the measuring cup, maybe it needs to be more compact. I live in Colorado, so it’s not very humid here. Thanks for describing the icing consistency prior to microwaving it. Mine was very smooth and not very pasty at all. Would the kind of milk alternative change things at all? I used Silk Almond milk. Thanks for your help!